Toronto’s housing market has become a target for money laundering or “snow washing,” thanks to anonymous property ownership, weak regulation and lax enforcement, according to a new study. Since 2008, $28.4 billion worth of housing was acquired in the Toronto region largely through private entities where owners can remain anonymous, according to a report released Thursday by Transparency International Canada, Canadians for Tax Fairness and Publish What You Pay Canada. In that period, $9.8 billion of housing was bought by companies through cash purchases, largely bypassing anti-money laundering checks on fund sources and beneficial owners, according to the study, which analyzed more than 1.4 million residential sales dating back to 2008. “Canada’s lack of beneficial ownership transparency makes our entire country an attractive destination for money laundering,” according to the report. 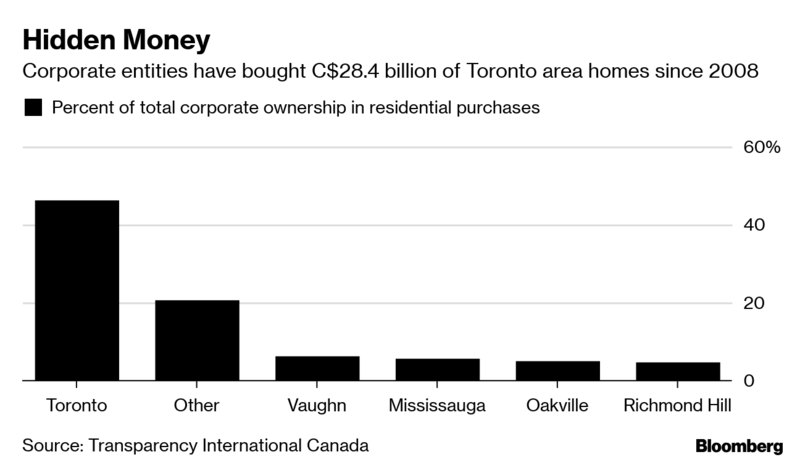 While some vacant properties in Toronto might sit as investments for legitimate money, a worrying amount slips past regulators who do not really know who owns what, nor how much is being used for money laundering and tax evasion, it said. The report follows a similar one on Vancouver in 2016 that revealed almost half of the city’s most valuable property owners were unknown and hiding behind shell companies, trusts and nominee owners. This led to greater enforcement from the provincial government, including proposing a registry for beneficial owners for property. The Toronto housing market has ranked among the least affordable in the world and became a target for speculative investment. The provincial government brought in a foreign-buyers tax in 2017 and instituted audits of real estate speculators in the region. The report argues that more measures should be implemented to shed light on the extent of anonymous ownership in the market, which includes requiring disclosure of beneficial owners of real estate as a prerequisite for any properties transfers. The Toronto Real Estate Board said in a statement that it would welcome a discussion with other housing market stakeholders, including the government, about requiring “beneficial” owners to identify themselves to land title authorities. The federal budget tabled on Tuesday included a proposal to spend US$16.9 million on strengthening the Financial Transactions and Reports Analysis Centre of Canada that would help boost scrutiny of the real estate and casino sectors with a focus on British Columbia.